If I was to launch a full critique of the content of David Cameron's speech, as I would like to, I would be let down by my lack of knowledge on economics and statistics, so instead I'm going to isolate one part of it and leave those bits to those more capable. Cameron mentions that people are getting sick of seeing those who do the right thing get punished and the wrong thing get rewarded - and what a reward it is for the people of the Daily Mail persuasion who are being so warmly appeased for that toxic combination of their xenophobia and their high likelihood of voting. As elections loom, what better time to blow on the ethnic embers with talk of a racial restoration? The PM blames the previous Labour government for closing down the debate on immigration and ignoring people's fears - there is an element of truth in this. 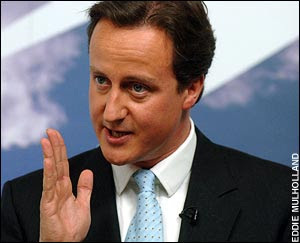 I agree with Cameron that working-class people feel disillusioned with mainstream politics and that they don't feel listened to - I am presuming he means working class people, since the Latvians aren't coming over in droves to become accountants and teachers, but to take up the lowest-paid work with the most unsociable working hours. The working class have every reason to feel alienated and overlooked - they are overlooked and have been since 1979. Not only that, but the public services that many rely on are being cut, benefits cuts mean that poverty is rocketing again - in these conditions, what more can Cameron expect? Is it cynical of me to question whether Cameron is only opening up the immigration/race debate again to detract attention from the more pressing issue of, you know, the slaughtering of the welfare state, the decline in living conditions and the lack of jobs that require few qualifications? The focus on nationality and ethnicity tidily displaces that waking dragon of social class. "Yes, you'll have less money to live on, but at least there'll be less Pakis about." "I want us to starve extremist parties of the oxygen of public anxiety they thrive on and extinguish them once and for all." They want all that public anxiety for themselves. It is jealousy, not equality, that has turned the Tories against the BNP in this situation. They are not addressing the reasons for this anxiety, which lie in the economic patterns which have disproportionately affected the poorest in society. Certainly, chances needed to be made to move with the times but a good society would at least attempt to put something else in place for those who had lost their jobs. Notably, racial tensions in communities aren't popping up in multicultural areas of affluence - so many problems which are dealt with as racial issues or, more euphemistically, cultural issues, all boil down into one group of poor people battling against other poor people. So what is the destination of this new tough stance? Cameron merely flicks the vision of class-poverty into monochrome. The poor will still be poor, but at least they'll be white.